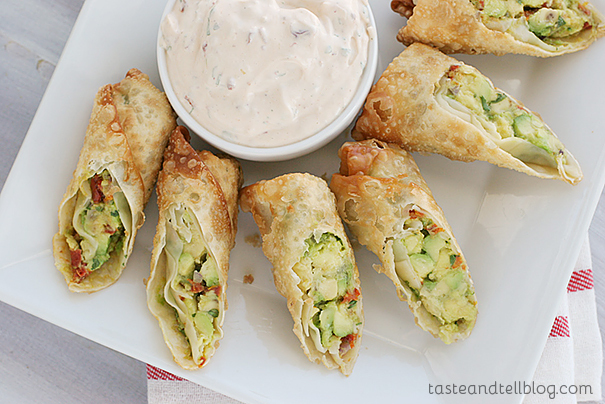 A riff on the popular restaurant appetizer, these Avocado Egg Rolls are easy to make at home and just as good! I am not normally a big tv watcher. I have a couple shows that I like to watch, but really, especially when it comes down to nighttime dramas, I have been pretty out of the loop lately. I started with Parenthood. When I had watched every episode, I moved onto Downton Abbey. Last week, I finally caught up on that one, and found myself looking for a new series to turn to. And there it was on Netflix – that series that I have heard so much about over Twitter and Facebook – Friday Night Lights. I have said it before – even though I do like sports, I don’t usually get all crazy about the Super Bowl. But after watching the first few episodes of Friday Night Lights, I’m totally feeling the football vibe. Heck, I may even watch some of it this year instead of hiding out in the kitchen with the food! That is, unless these egg rolls will be gracing that table filled with football snacks. These egg rolls alone would be worth hiding out in the kitchen over. And if there is one time a year that you should break that New Year’s resolution and fry up some egg rolls, the big game should be that day. Believe me – these are worth it!! Make the dipping sauce: In a small bowl, combine all ingredients and mix well. Refrigerate until ready to use. Make the eggrolls: Heat several inches of oil in a Dutch oven or heavy pan until it reaches 350F – 375F. 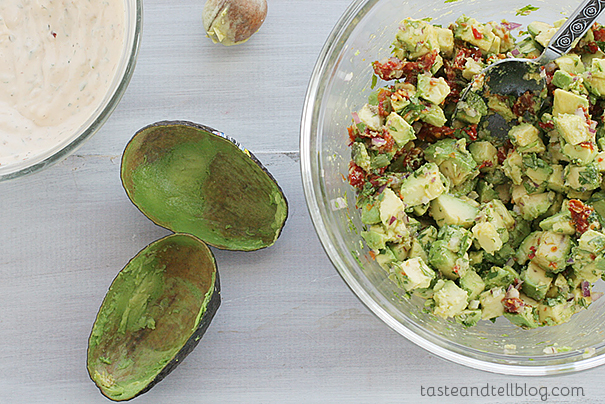 In a large bowl, combine the avocados, sundried tomatoes, red onion and cilantro; mix. Working with one eggroll wrapper at a time, lay the wrapper on a surface in front of you like a diamond. Add about 1/4 cup of the avocado mixture to the center. Fold in the two sides, then fold over the bottom. Roll until the filling is completely enclosed in the center of the roll. Wet the corner of the wrapper so that it will stick. Continue until all 9 rolls are wrapped. Drop the eggrolls into the hot oil, 2 or 3 at a time, and cook until golden brown. Drain on a paper towel lined plate. 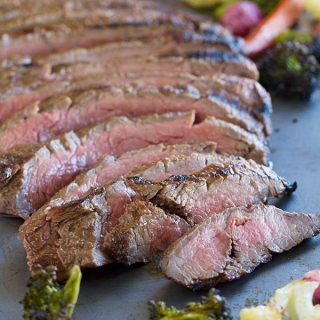 Cut diagonally and serve with the Chipotle Ranch Dipping Sauce. A wonderful idea! Really scrumptious looking and sounding. Love these, Deborah! I think these are absolutely perfect for any game day! 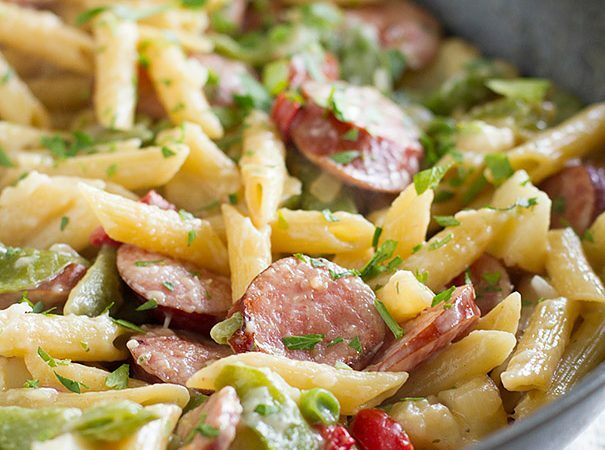 This recipe looks like a delicious way to do just that. Uuuuuuugh I want 75 of these for breakfast. YUM. These are amazing! My fruit bowl is never without avocados so I definitely need to give these a try! Yesss! Friday Night Lights is theeee best! 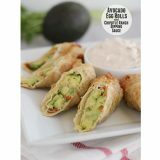 I love the avocado egg rolls at Cheesecake Factory so I think i definitely need to try these!! Gosh, these look good! I so want to just reach into my screen and grab one (or two or three!). Oooh this is going on my must make list!! Wow, this could be addicting….in a good way! I MUST try making these sometime. I’m avocado- obsessed! These look fantastic! I hope someone throws a Superbowl party and asks me to bring food! I found your blog looking for cinnamon biscuits (awesome recipe), then made the pan snickerdoodles last week (devoured) and now I’m drooling over these egg rolls! Can’t wait to try them! So glad I found you! 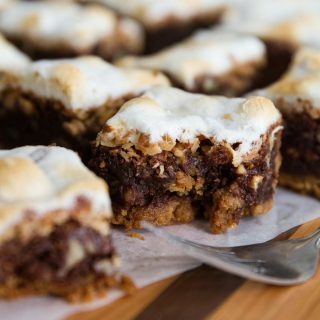 I’ve always wanted to make these but wasn’t sure the best recipe. Now that you’ve posted it, I know which one to use! I’ve heard so many good things about Friday Night Lights—need to jump on that train! OMG! Love these! Anything avocado and I’m in! Yummm! What an original combination!!! I think we are soul mates. Your food is almost always something that makes me wonder if we were separated at birth! 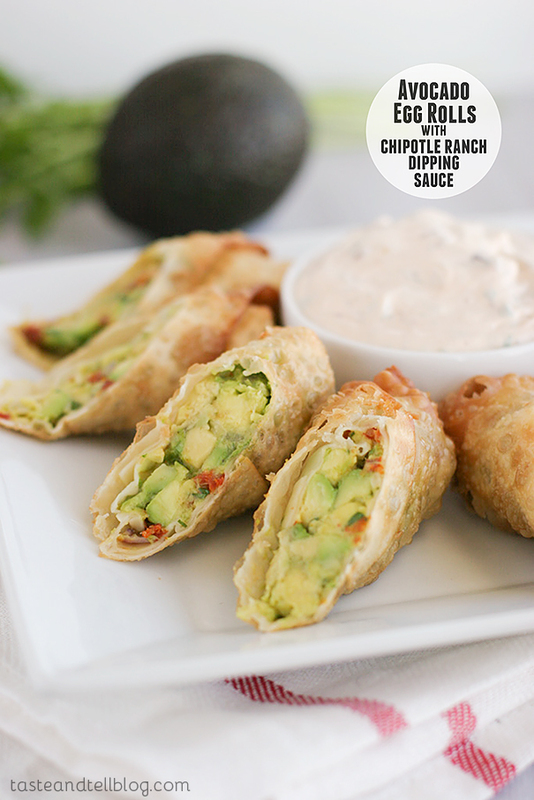 Fried egg rolls filled with avocado. I mean, can you even get any better than that?! Also, yes to Downton Abbey and Parenthood. I haven’t seen Friday Night Lights, but I might give it a shot now. I would kill for some of these egg rolls right now. They sound so good, Deborah! haha! I loved Friday Night Lights, Downton Abbey, and Parenthood. I don’t watch tv during most of the year, but during the dark winter months when we aren’t working (my husband and I farm) we watch these shows! These egg rolls sound fantastic!!! holy cow, i MUST have these. they look amazing! I love the invention of the DVR, a way to “tape” shows and catch up with them later. I have been known to watch several episodes right in a row. Darn things can be quite addicting. Um. Yeah. These look amazing. And I don’t even know what restaurant they are a copy cat of. Have fun with FNL! I got so addicted right after John was born, and I’m thinking I need to re-watch it all again. 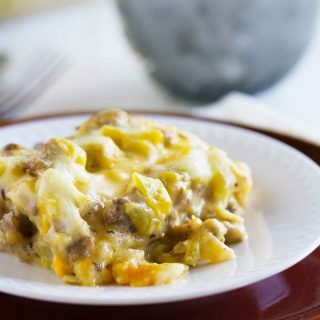 These look like perfect game time food! 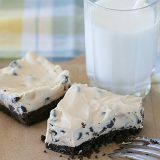 Looks amazing- I think I am going to need to make these for the Super Bowl! 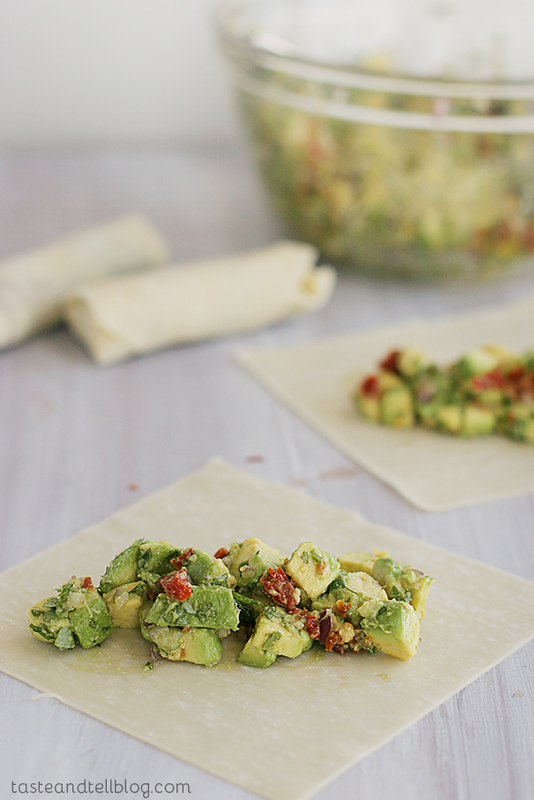 I am definitely going to make and serve this Avocado Egg Roll recipe. These look and sound delicious ! These look absolutely delicious! What a fun and creative way to use avocado. My mouth is watering. Got to try these! Looks Delish! I always have avocados on hand. Will definitely try this recipe. I am loving everything about these! What great flavors and textures. I still need to get into FNL and Downtown Abbey. I’m way behind in my TV watching! these are so similar to the ones that I LOVE from Cheesecake Factory! I DID NOT need to know how to make these at home! I am doomed for sure, in a happy tummy kinda way! 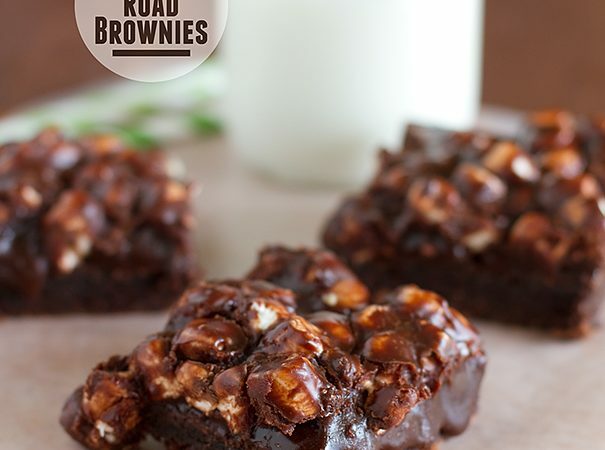 I think I could eat these, they look awesome…..
I’m so all over these for SuperBowl!! And I’m so glad there is another Downton-Addict. I’m a goner. Oh my goodness – every time Jason and I go to cheesecake factory, we get these eggrolls but now we don’t have to – I can make it right at home! I have no idea from which popular restaurant these rolls originate, but they still look delicious! Iwould love to win this prize. I often have to work late into the night to get work done. I have to keep the TV on to keep me up. Right now I am watching Fringe and have Friday Night Lights on my list to watch next. Oh and I can’t forget to mention that these egg rolls look amazing! Ok, so I have a silly (and possibly annoying) question! Do you think you could bake these instead of frying them? These look soooo good, but I hate cleaning up after frying anything, so I just avoid it! @Rachel, I haven’t tried them baked, so I really don’t know. I know people who really don’t like baked egg rolls at all (made with egg roll wrappers), but I have a buffalo chicken roll recipe that is baked and I like it. So I think it’s all personal preference! If you do try, let me know what you think! I would love one of these. Have a feeling that would lead to another & another. Thanks for sharing on Thursdays Treasures. These looks so delicious! Pinned, sharing on Facebook, and featuring tomorrow 🙂 Thank you so much for sharing at Mom On Timeout! I’m dying over your photos–they are simply amazing. And avocado egg rolls? Squeeeeeeeee. I. NEED. 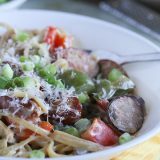 Thanks so much for linking up at What’s In Your Kitchen Wednesday! Eeekkk!! 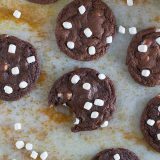 These look ahhhh-mazing! I’m pinning and making ASAP. Are these best when eaten right away? Will the avocado brown a lot if I made them for a party? I want to make these for the super bowl, but I am worried they won’t look appetizing just sitting out! @Sam, I would serve them within a couple hours. The avocado didn’t go brown on mine, but we ate them within probably 2 or 3 hours. And I think that if you made them too far in advance and had to refrigerate them, they might get soggy. So I saw these and knew that they’d be the perfect way to use up the egg roll wrappers I had left in the fridge. Oh…my…GOD they were amazing! Thank you so much for the recipe. I made a homemade ranch mix to avoid buying one with junk in it from the store. Perfection! I posted it over on my site with a link back to yours. Thank you so much for this fantastic recipe! I am so excited to make these for the Super Bowl!!! This is one of my all time favorite apps. Thanks for sharing with us over at Real Housemoms for Fabulous Fridays! I hope you’ll come again this week. These were awesome. I used whole wheat tortillas because that is what I had. Green onions instead of red onions. No cilantro. yuk. The dipping sauce was soooo gooood. @Teresa, I’m so glad you enjoyed them!! oh, I did put in some fresh lime juice since I knew we’d have leftovers and I didn’t want the avocados to go brown. How many calories is in this egg rolls?